As four days of celebrations to mark the Queen's Diamond Jubilee come to an end, the UK papers reflect on the events' legacy and what insight the festivities give, if any, to how Britain views the monarchy. The Queen is a "a good trouper" and her fellow countrymen are prepared to respect, even love her for it, Michael White explains in the Guardian.And the country needed the Jubilee, adds Simon Jenkins. "The ceremonies were a good news relief from horror, tragedy and recession... people smiled at each other - a habit rare among the British. The enjoyment is real, he adds. "From time to time, there is no harm in sensing communion with one's country." Now, "real life must resume". The Jubilee was a "last hurrah for a vanishing age" of monarchy , says the Independent. The "The visual message was one of stability and continuity", but we witnessed a Britain "whose like will not be seen again, because it is passing so swiftly into history". Still Christina Patterson says of the Queen "she did her duty... and they loved her for it". And at least for once, says Matthew Norman, "the country seems at ease with itself". The public got a glimpse of a Royal family "remade for our times" , says Neil Tweedie, in the Telegraph. The paper believes the Queen used a pared-down balcony appearance to signal a "clear message on the monarchy's future" - demonstrating Prince Charles is ready to take on his mother's duties. And we witnessed the emergence of a "a new and more loveable" Prince Charles, adds Elizabeth Grice - "who caught the public mood brilliantly". 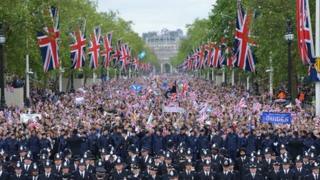 All-in-all, the Jubilee was a great triumph for the monarchy, says the Telegraph. It demonstrated that the Queen remains "the great unifying principle and rock of constancy". The Queen has led the monarchy to a "remarkable comeback" , according to the Times. "Our decorative, disarming descendant of dynastic rule has seldom seemed a more natural fit," its leader says. It agrees the balcony appearance was a "carefully constructed" tableau of "dynasty, succession, continuity" - only essential royals were selected. The paper also rejoices that the Jubilee has been "all about families, functioning, working and celebrating together". And it praises the Archbishop of Canterbury, Dr Rowan Williams, who "found his voice" at St Paul's Cathedral on Tuesday with a "call to wisdom". The Daily Mirror sees the celebrations as an "affirmation" of all that British people can be proud of. For commentator Tony Parsons, the festivity reflected "our history, our traditions, our people" and above all the "small, unassuming" 86-year-old monarch who connects to everything that is British and makes "us unique". He writes, at a time when Britain is faced with "uncertain times" the Queen, "who has seen 12 prime ministers come and go", can act as the link to the glorious past the country has witnessed. The Daily Express also picks up on the "powerful sense of continuity with our past". Columnist Leo McKinstry thinks thousands of Britons, who assembled in London or watched the celebrations from home, were at their patriotic best and no British sovereign was "more secure" on the throne than Queen Elizabeth is today. He adds the Jubilee is a "hammer blow" to the pro-Europeans and the "multi-cultural progressives" who think nationhood and monarchy are "outdated" concepts. For The Sun , the celebrations were a show of national unity. In its editorial, the paper says the country which is "mired" in gloom and recession is suddenly lifted after four days of "spectacle and celebrations". The cheering crowds, the "pomp" and "splendour" have been a "priceless advert," the paper says, and will give rise to "optimism" for the future. The Daily Mail reflects on how the Queen conducted herself during the celebrations, which in themselves combined tradition and modernity. For commentator Robert Hardman, if the concert at Buckingham Palace was an "emphatically modern affair" then the river pageant had "echoes of the distant past". He says future historians will "draw heavily" on the Diamond Jubilee celebrations to make an assessment of the Queen, who has changed from being a "national matriarch" to "one of the greats" in the history of the British monarchy.